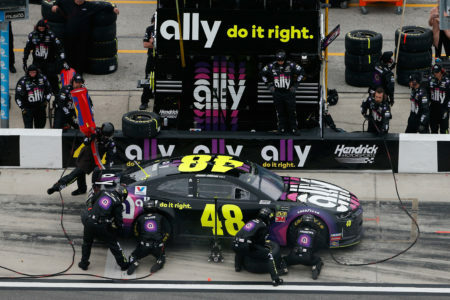 Starting from 13th place Car 48 Jimmie Johnson Ally Chevrolet Jimmie Johnson has won the 2019 Advance Auto Parts Clash at Daytona International Speedway; his 2nd in the non-points paying event (2005, 2019). Jimmie Johnson has made 17 starts in the Advance Auto Parts Clash posting 2 wins, 6 top fives and eight top 10s. 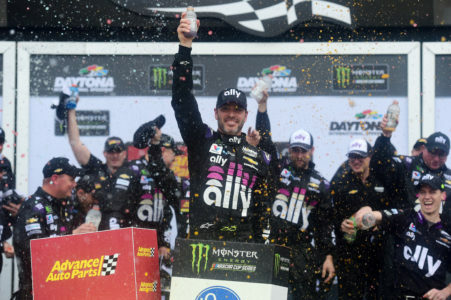 A total of 10 different drivers have multiple Advance Auto Parts Clash wins: Dale Earnhardt (1980, 1986, 1988, 1991, 1993, 1995), Dale Jarrett (1996, 2000, 2004), Kevin Harvick (2009, 2010, 2013), Tony Stewart (2001, 2002, 2007), Denny Hamlin (2006, 2014, 2016), Neil Bonnett (1983-1984), Ken Schrader, (1989-1990), Jeff Gordon (1994 and 1997), Dale Earnhardt Jr. (2003, 2008) and Jimmie Johnson (2005, 2019). 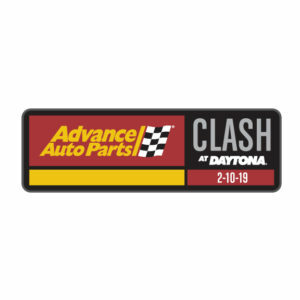 The 2019 Advance Auto Parts Clash at Daytona International Speedway is a non-points race that starts off Speedweeks. 2nd Place Car 1 Kurt Busch Monster Energy Chevrolet, started from 19th place posted his 4th Top 5 finish in the Advance Auto Part Clash. 3rd Place Car 22 Joey Logano Shell Pennzoil Ford, started from 7th place posted his 4th Top 5 finish in the Advance Auto Part Clash. 4th Place Car 12 Ryan Blaney Menards/Peak Ford, started from 8th place followed by 5th place Car 88 Alex Bowman Nationwide Chevrolet, started from 5th place. 6th Place Car 3 Austin Dillon Bass Pro Shops/Tracker Boats Chevrolet, started from 9th place followed by 7th place Car 9 Chase Elliott Mountain Dew Chevrolet, started from 16th place. 8th Place Car 10 Aric Almirola Smithfield Prime Fresh Ford, started from 18th place followed by 9th place Car 6 Ryan Newman Wyndham Rewards Ford, started from 4th place. Lastly in the Top 10 was Car 41 Daniel Suarez Haas Automation Ford in 10th place, started from 10th place. 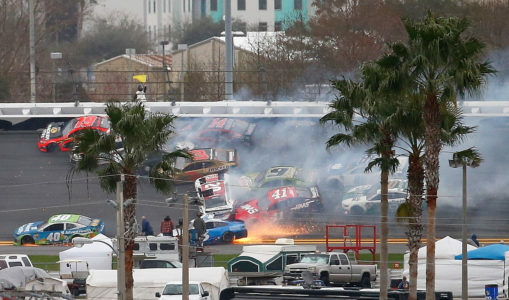 The race had Cautions 4 for 20 Laps: 1st Caution on lap 9 for Weather [Red Flag: 21:31]. 2nd Caution on lap 27 for Lap 25 Segment Conclusion. 3rd Caution on lap 41 for Weather [Red Flag 8:05]. 4th Caution on lap 57 for #2, 3, 4, 6, 9, 10, 11, 14, 18, 19, 20, 21, 40, 41, 42, 48, 88 Big Crash on the Backstretch. 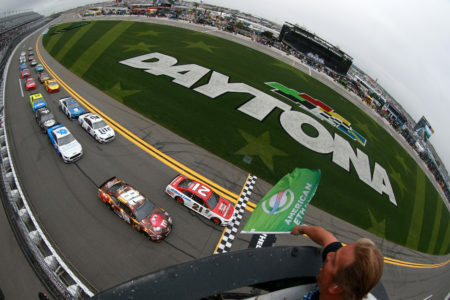 The race had 5 Lead Changes among 4 drivers; P. Menard 0; K. Busch 1; P. Menard 2-24; A. Dillon 25-27; P. Menard 28-55; J. Johnson 56-59. Paul Menard led the most laps of the 2019 Advance Auto Parts Clash with 51. This was a very weird race with Car 48 Jimmie Johnson Ally Chevrolet & Car 21 Paul Menard Motorcraft/Quick Lane Tire & Auto Center Ford having contact taking out most of the field. After the crash the race was called due to weather giving Jimmie Johnson. I was expecting protests as Johnson should have gone tail for causing the crash, plus when did the yellow come out as he was below the yellow line. Needless to say this will give people some stuff to talk about before the duels. 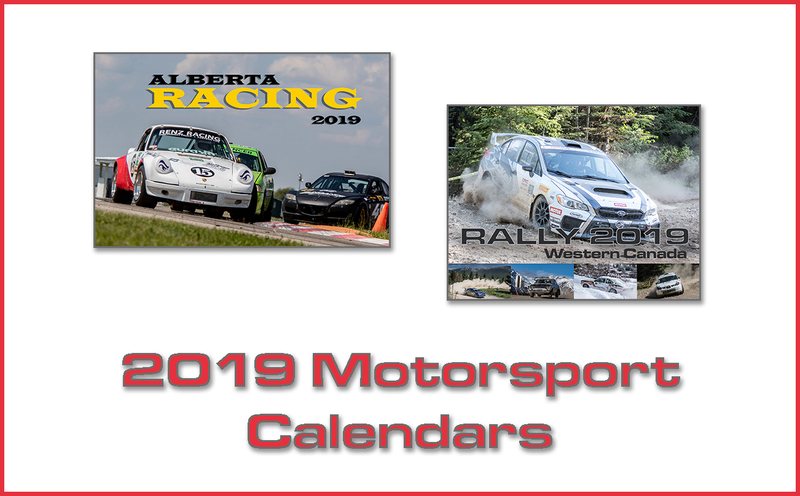 Race Comments: Prior to the start of the race, the following car(s) dropped to the rear of the field under penalty for the reasons indicated: 9, 11 (backup). 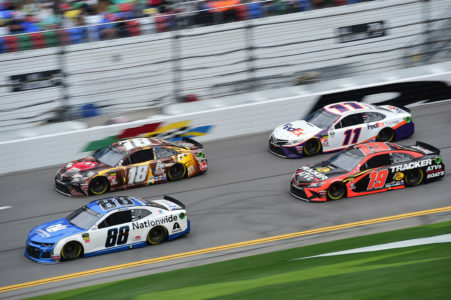 Failed to Qualify: (22) 1 Kurt Busch, 37 Chris Buescher, 38 David Ragan, 6 Ryan Newman, 34 Michael McDowell, 27 Casey Mears, 71 Ryan Truex(i), 47 Ryan Preece #, 40 Jamie McMurray, 95 Matt DiBenedetto, 62 Brendan Gaughan(i), 42 Kyle Larson, 43 Bubba Wallace, 13 Ty Dillon, 36 Matt Tifft #, 96 Parker Kligerman(i), 15 Ross Chastain(i), 00 Landon Cassill, 32 Corey LaJoie, 52 Cody Ware #, 51 BJ McLeod(i), 66 Joey Gase(i). Caution Flags: 4 for 20 laps; Laps. Lead Changes: 5 among 4 drivers. Time of Race: 1 Hrs, 20 Mins, 1 Secs. Average Speed: 110.602 MPH. Margin of Victory: Under Caution.